While all I shared in my previous posts has improved my photography immensely, I think that far and away the greatest impact on my photography development has been learning to edit images well. I use a combination of Adobe Lightroom and Photoshop *, and while they are not free, there is a wonderful Cloud option from Adobe* these days that provides you with both for around $10/month. Totally worth it in my opinion. Today, I will be talking about my editing process in Lightroom. Let me begin by saying what this tutorial is not. 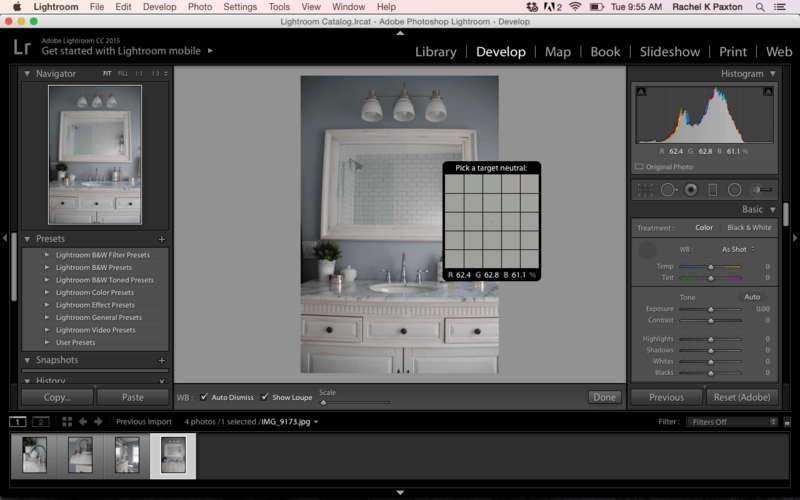 This tutorial is not an introduction to Lightroom or even how to edit photos in Lightroom. If you’ve never used Lightroom before, you may be intimidated by the way you have to import and organize your photos… Start by searching some tutorials for that and then come back here. This tutorial is also NOT a comprehensive list of all the wonderful things you can do to photographs to improve them in Lightroom (that could take weeks!). 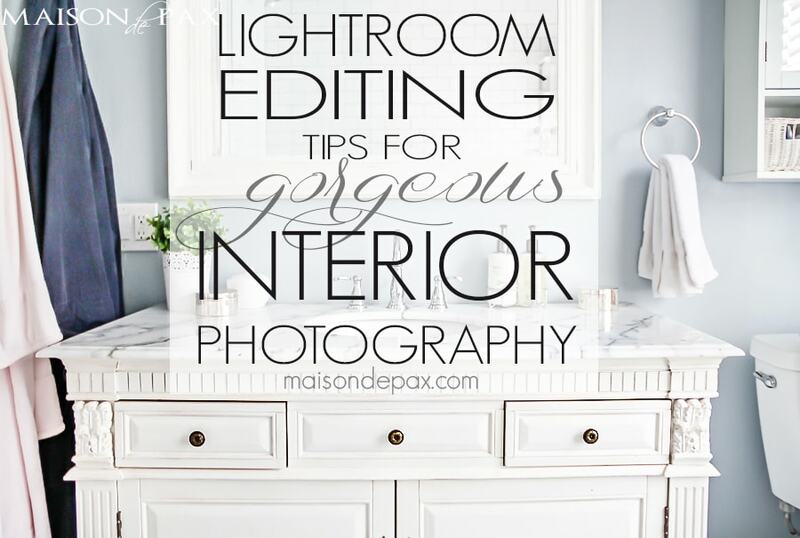 What today’s tutorial IS, however, is how I edit almost all of my interior photographs in Lightroom, including my favorite tricks and tips. I will be sharing the step, a screenshot of my Lightroom screen, and an explanation. I hope it all makes sense! Before I begin, let me tell you that I’m using an old photograph (about 2 years old), so you can see the full effect of the editing options. I’m pleased to say that my photography has improved significantly, and I no long need to edit each image quite this much, but I wanted you to see the full range of possibilities. Here is the SOOC (straight-out-of-camera) shot – complete with crazy distortion because the room is so tight – compared to the final, edited image. 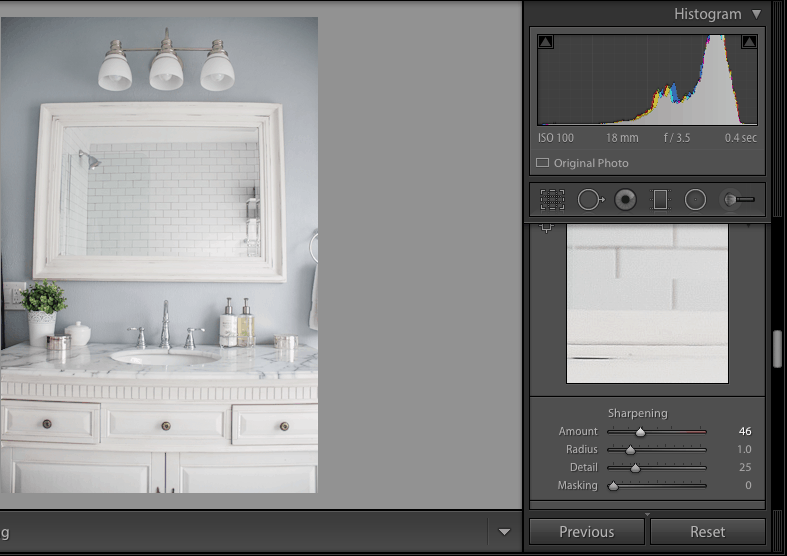 Lightroom has this nifty dropper tool that you can use. This particular image didn’t need any white balance adjustment, but I always start with this step. Grab the dropper from the slider section on the right (by clicking on it) and click again on a gray area in your image. Now, as we all know, computers may be brilliant, but they don’t think for themselves. So be sure to use your own eyes and adjust the blue/red and green/purple sliders manually if necessary. Again, in your slider section, find your happy place with these. I almost always lighten my shadows and drop my highlights. If it starts to look too washed out, though, I will darken my “blacks” to compensate, as you can see I did in this image. After leveling out your lights/darks and lightening your entire photo, it can look a little flat and washed out. Here is where Clarity comes in. I almost always raise this 15 or higher (just using my slider until it looks right). Vibrance and Saturation can have similar effects – adding punch, if you will. I love this little zoom box (see the sidebar). It shows you up close what your image looks like. When you increase your sharpening, you’ll notice the picture becomes grainy. Grain is the enemy. Kill it. This is your secret weapon, friends. When you increase your luminance, you give your image a slight glow and blur, which removes the grain. Score. You do, however, have to be careful not to use too much because it will actually make the image look like a cheap dream scene from a B movie. No joke. The sweet spot for luminance is the minimal amount you can use to remove any grain, especially from the dark corners of your image. 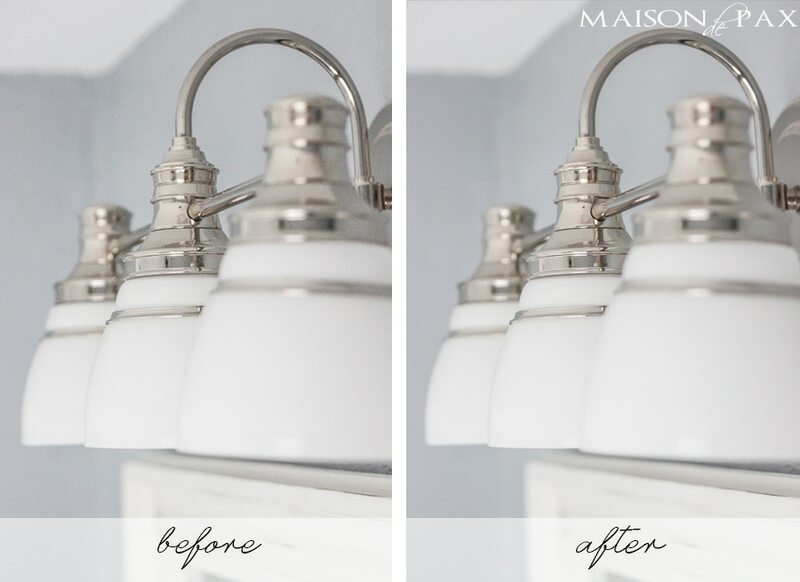 The image we’ve been following had so much natural light that luminance wasn’t as important, but take a look at this much darker image of the light fixture and the difference that luminance makes. 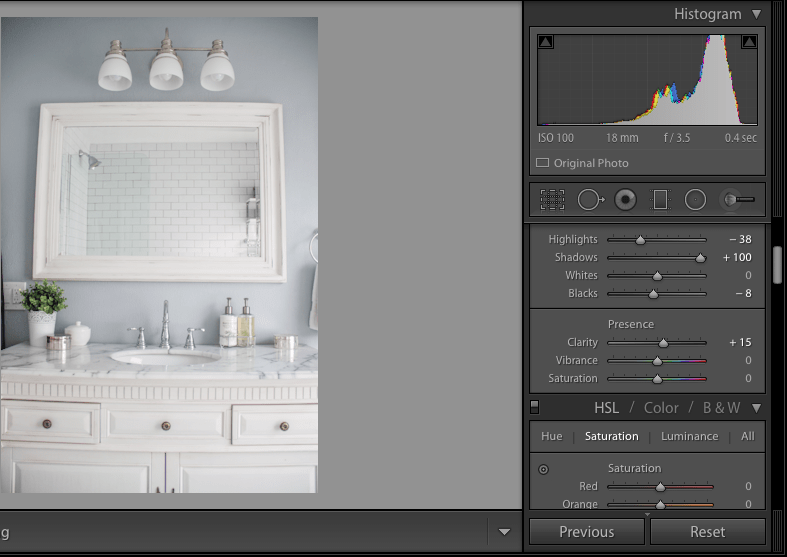 This entire editing section in Lightroom has changed my picture taking. Remember in my post on Staging and Composition when I said you should be “square” on your subject? Here is the compensation for human error. You can always start by using their automatic corrections. Just make sure you are on the “Basic” tab, check all three boxes, and click Auto. Sometimes, this is perfect. At other times, though, (like with white balance), the computer can only do so much. That’s when the “Manual” tab is helpful. Start by checking the box “Constrain Crop.” Don’t be afraid to play with all of the sliders. Distortion is the most important one if your image is bending (like the image we are examining – notice how the mirror looked curved?). The rest are helpful, too, though, and it will work wonders towards getting your images square. This is only relevant sometimes. When using a zoom lens, the corners of your images can appear darker, and this adjustment will compensate for that. Just move it along until it looks right. And that’s it! That’s all I do in Lightroom. It may sound like a lot, but once you get the hang of it, you just fly down that column on the right adjusting your sliders until the image is done. It’s pretty painless. Don’t forget to export your images (remember, this is not a full Lightroom tutorial… too much info for one post!). Next stop: Photoshop for a tiny little boost and a watermark. 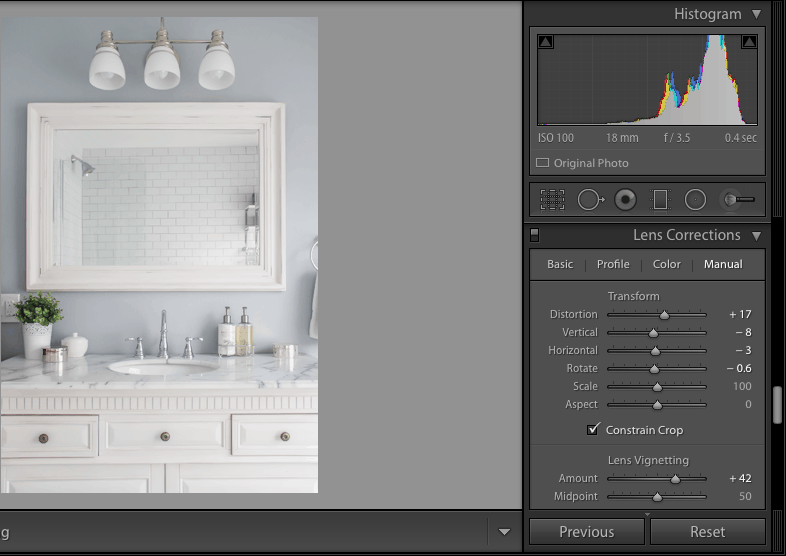 Until then, which of the tips above is your favorite new tip for Lightroom*? And for you Lightroom users out there, do you have any favorite tips you’d like to share that I missed? Put them in the comments below, and I’ll even give you a shout out later if it’s one I haven’t heard of! Ah….this is the post I’ve been waiting for 🙂 I saw it in my feed this morning before leaving for work and had to read it in the few minutes that I had. 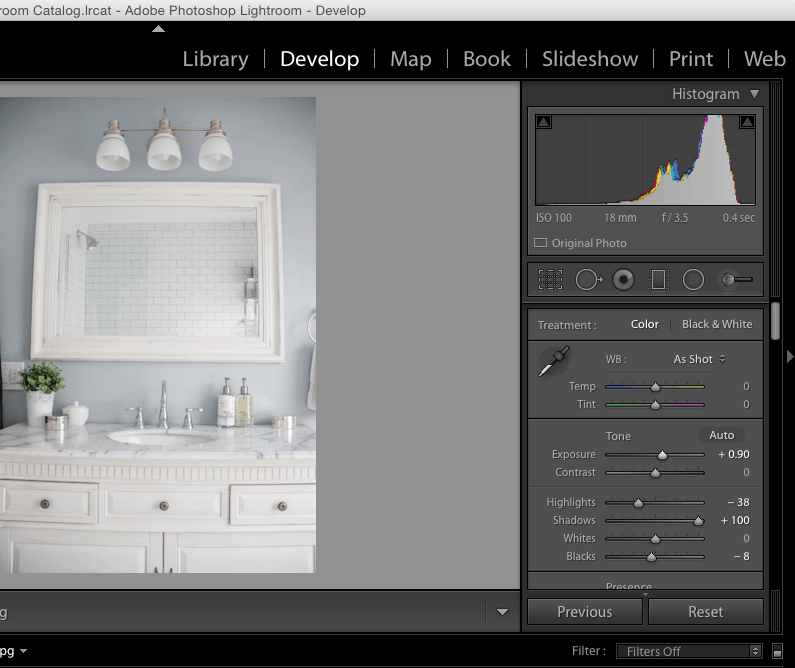 This is THE BEST tutorial I’ve seen for using lightroom. I started using it a few months ago and am so lost with all the things I can adjust. But this spells everything out so well in language I can understand and copy. 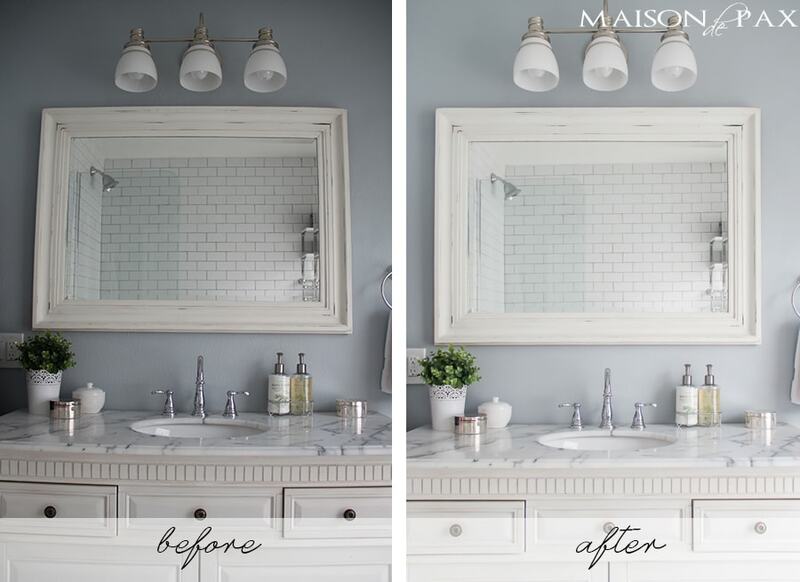 It was really helpful to see how you changed the dark before picture into one of your signature bright and clear afters. Thanks for putting so much work into this series! I’m SO glad you found it helpful, Jamie!! Thanks for the sweet comment! Gosh, I loved this! What I think is super crazy . . . I have been using lightroom for years and never really adjusted shadows and highlights all that much. I was surprised to see it as one of the first things you did. Definitely playing with those sliders next time I edit my pics. Wondering, do you use presents all that much? Like ones you’ve purchased and loved or do you set your own presets? I think it would be super helpful to see if you edit an image with people and skin tones in it the same as a room shot. I know adding that much clarity and luminescence can be scary with head shots. Wonderful series girl! Truly enjoying it! Thanks, Cami! So glad you like it! Truth be told? 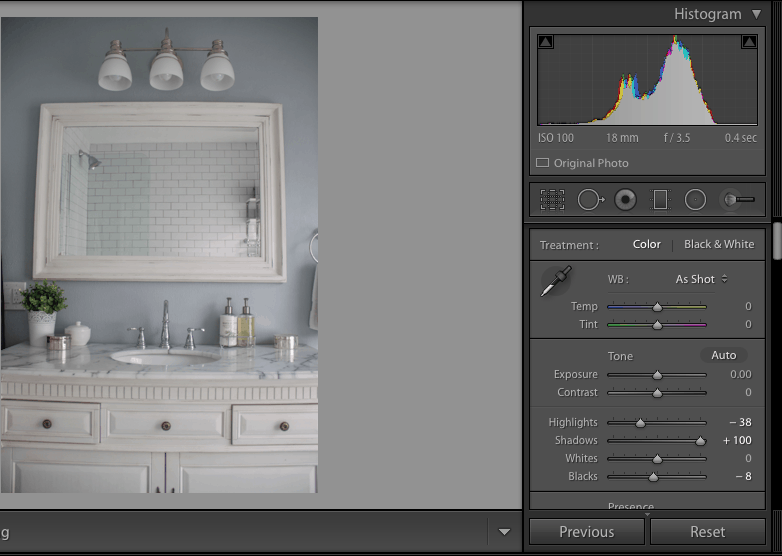 I’ve never used a preset in Lightroom. I bet they would help, but since I first learned to do it manually, I’ve just never branched out beyond that. In Photoshop, however, I’m the opposite. I mostly just use a series of actions there (tutorial coming tomorrow). You are right, though, it’s a totally different beast editing portraits. I don’t do nearly as much of it, but I find I use very different combinations. Beautiful! Such great tips! It was so good seeing you at Haven! Thanks, Kari! So good to see you, too!! What is the name of the gorgeous paint in this bathroom? Needed this post! I am pretty familiar with Photoshop and that is what I normally use to edit photos. But I recently bought Lightroom and I am completely lost! This tutorial is going to be very helpful. I’m saving it so I can refer back to it when I start editing my next photos! Thanks Rachel! 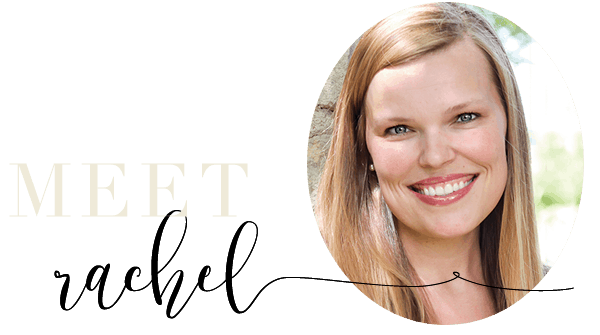 Thank you so much for taking the time to write this whole series, Rachel! I’ve really gained a lot from your tips. I was clueless about so many things in Lightroom, but this really helped! I was going to send you one of my pics to take a look at, but I don’t think that I’ll have to bother you with that now. I am loving this whole series, very helpful! I struggle with any shots that include windows. Especially if I want to get shots of the window treatments on the windows. I’d love to read a whole post on how to do that! That’s a great idea, Roxanne! Maybe that will be the next one I tackle. Thanks! Thank you so much for this entire series. A month ago, I purchased my Canon Rebel (copying you) and I followed all of your tutorials. I now have beautiful images of my home on my new blog. I know I still have a long ways to go with my photography skills, but this series was the most user-friendly and helpful that I have come across. When unsure about something, I find myself coming back to these posts. You are so welcome, Erica! I can’t tell you how much it pleases me to hear that. I hope you continue to enjoy it!! What version of lightroom and photoshop do you use? I’m loving you photography series! Thank you so much, Ruthie! I have the Adobe Creative Cloud monthly subscription, so it provides the latest versions of Lightroom and Photoshop. Love your series! Question do you shoot in Raw or jpeg? Great question, Ivonne, and thank you so much! 🙂 I shoot in jpeg for two reasons: first, my computer software that was supposed to read my Raw images was messed up for a while. Second, I already struggle with storage space using jpegs; I can’t imagine finding enough space for Raw images! Loving this series!! 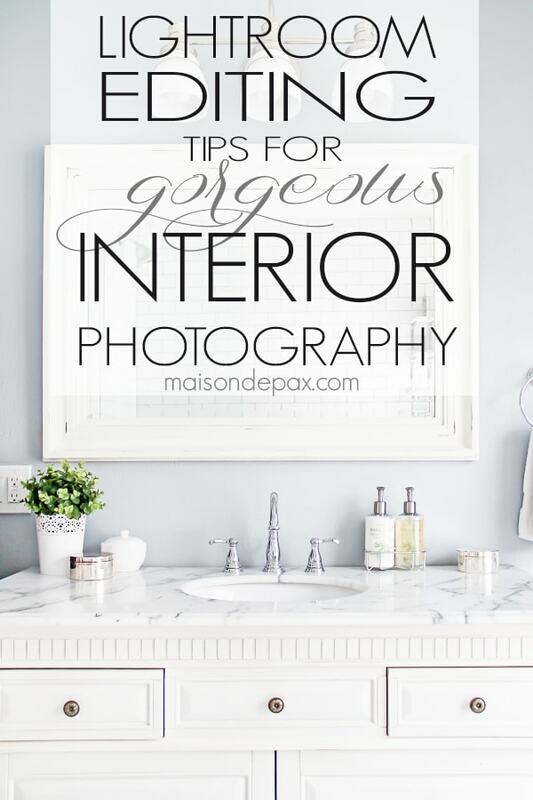 I have been battling to shoot interiors and you have given me so great pointers. Going to try the ISO at 100 even on a tripod and see how I go because I have been getting good light but a grainy finish. Congrats on a great blog and a great informative series. I’m so glad to hear that, Eva! What a wonderful comment. I hope you enjoy the product of your efforts! Hi Rachel…I have been blogging for almost 2 years, and now investing in upping my photography game! I love your posts and I am learning so much. The links for Photoshop are unavailable on Amazon at this time, do you have another way I could purchase them w/ you as the affiliate? Thank you so very much! Kelly, you are SO kind to check on this!! I’ve fixed the links in the post, but here is the affiliate link for you: http://amzn.to/2gMwakX . I hope you enjoy using the programs!! Hi Rachel! Thank you so much for your details on editing. I use Lightroom to edit and I am thinking about also getting Photoscape. 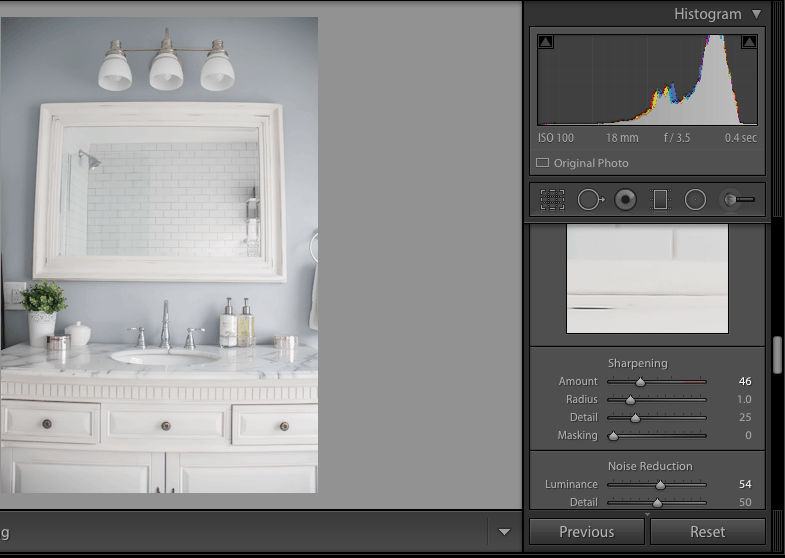 What does the Boost Action in Photoshop add to your images that Lightroom can’t? I’m not super impressed with the Lightroom watermarks also. Photoshop is great for photo editing if you prefer that! I prefer Lightroom because the editing process is quicker. I just finished your first tutorial and I have already learned so much. I started using Lightroom like a couple months ago and I’m totally hooked. I’m so excited to start using it even more in depth! Thanks so much for this wonderful series. Janine, I’m so glad it has been helpful! You already take such beautiful photos, but I’m glad you feel it’s giving you more confidence with your camera.